INDIANAPOLIS — Takuma Sato finished a brave pass of Helio Castroneves with five laps remaining on May 28 to cap a day of drama with a victory in the 101st Indianapolis 500 presented by PennGrade Motor Oil. “Unbelievable feeling,” Sato said. “I cannot thank this whole team enough. Fantastic. 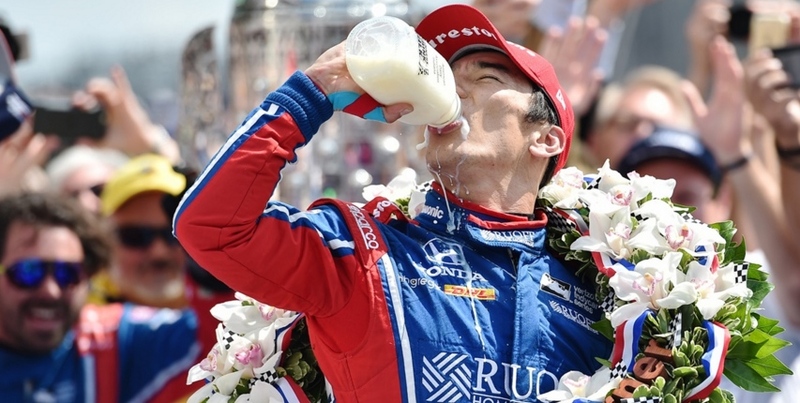 The victory provided a measure of redemption for Verizon IndyCar Series veteran Sato, whose previous best Indianapolis 500 finish was 13th in 2013 and 2015. He dueled side by side with Dario Franchitti for victory on the final lap in 2012 before crashing in Turn 1 and ending up 17th. Rookie Ed Jones finished third in the No. 19 Boy Scouts of America Honda, his best Verizon IndyCar Series finish. Castroneves fell just short of joining A.J. Foyt, Al Unser and Rick Mears as the only four-time winners of the “500.” It was incredible he even contended after starting a career-low 18th and suffering damage in an early incident. On Lap 53, Jay Howard hit the SAFER Barrier in the outside of Turn 2 and caromed back on the 2.5-mile oval in his No. 77 Lucas Oil/Team One Cure Honda. Pole sitter Scott Dixon had nowhere to go and hit Howard’s car, launching into the air and hitting the catch fence hard, inflicting heavy damage to his No. 9 Camping World Honda. The accident caused a 19-minute red flag for wall repair and track cleaning. Dixon and Howard were unhurt. Castroneves just avoided the melee but clipped the inside SAFER Barrier, damaging his front and rear wing. He was forced to the pits for a new nosecone. On the ensuing restart, Castroneves jumped the start and was penalized with a drive-through penalty. Yet savvy pit strategy by Team Penske and a strong No. 3 Shell Fuel Rewards Team Penske Chevrolet after the repairs helped Castroneves jump to the lead from Lap 96 to Lap 103, and he remained a contender for the rest of the 200-lap race. 2014 race winner Ryan Hunter-Reay took the lead in the No. 28 DHL Honda on Lap 104 when Castroneves pitted. He was one of four Andretti Autosport drivers out front today, as Hunter-Reay, rookie Fernando Alonso, Sato and 2016 winner Alexander Rossi combined to lead 95 laps. Another powerhouse Honda team, Chip Ganassi Racing, appeared late in the race to have a good chance at its first victory since Franchitti’s triumph in 2012. Max Chilton took the lead on Lap 169 after the last round of pit stops for nearly every driver in the 33-car field. Chilton stayed out front in the No. 8 Gallagher Honda and kept the lead on the final restart of the race, on Lap 189 after a five-car crash in Turn 2 involving Josef Newgarden, James Hinchcliffe, Will Power, Oriol Servia and James Davison. Sato drove side by side with Chilton in Turn 1 to try to gain the lead on Lap 191, but Chilton parried the move. Then it was the relentless Castroneves’ turn. He hunted down Chilton and passed him with a bold outside move in Turn 3 on Lap 194. Meanwhile, Sato passed Chilton for second on the same lap and then zeroed in on Castroneves to make his decisive pass on the next lap. Castroneves looked outside of Sato for the lead in Turn 1 on Lap 199, but he never had enough momentum to challenge over the final two laps. “I really wanted to get the fourth (win) for everyone,” Castroneves said. “Don’t get me wrong: I tried. Unfortunately, it was just a little bit short. Heralded rookie Alonso, a two-time Formula One World Champion, finished 24th after smoke trailed from his No. 29 McLaren-Honda-Andretti Honda while running seventh on Lap 180. Alonso led four times for 27 laps.